Detailed Compatible Models - 4396841 ; 4396841B ; 4396841P ; 4396841T ; 4396842B; 4396710 ; 4396710B ; 4396710P ; 4396710T ; 4396711B ; ; 4396842;PUR - W10121145 ; W10121146 ; W10177635 ; W10186667 ; W10193691 ; W10193691T ;Kenmore - 46-9020; 46-9020P; 4609020000; 469020; 469020P. Efficient Contaminants Reduction- chlorine taste, odor, sediment, dirt, rust,turbidity,heavy metals and harmful sediments will be furthest reduced by activated carbon. For the best filtration results, please replace the filter every 6 months or 200 gallons to maximize contaminant reduction. Used in side-by-side, top freezer and bottom freezer refrigerators which accept Filter 3. 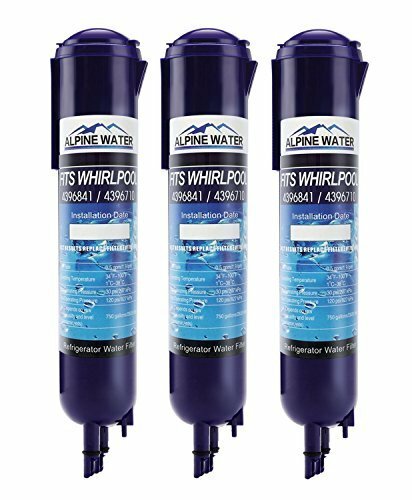 If you have any questions about this product by ALPINE WATER, contact us by completing and submitting the form below. If you are looking for a specif part number, please include it with your message.